An ill-fated warship named after Nottingham which caused the Royal Navy major embarrassment when it hit rocks while on deployment off Australia has been formally taken out of service. 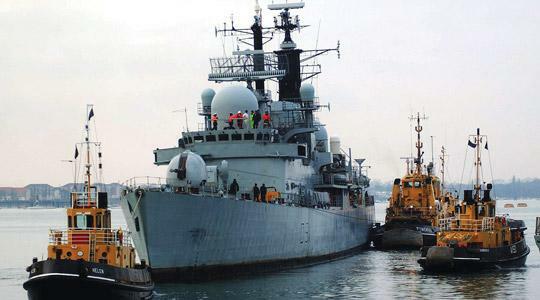 HMS Nottingham infamously had to be brought back to the UK on a transporter ship after the accident off Lord Howe Island, Queensland, on July 7, 2002 which ripped a 100-foot hole in the ship. The repairs, costing £26 million, took 18 months to complete and the commanding officer Commander Richard Farrington and three of his officers were disciplined at court martial in connection with the crash. Among the guests at the decommissioning ceremony, held at Portsmouth Naval Base, were several of the ship's 15 former commanding officers as well as representatives of the ship's affiliate organisations from the city of Nottingham. The service was conducted by naval chaplain the Reverend Ralph Barber, with musical accompaniment by The Band of Her Majesty's Royal Marines. The guests also included the former First Sea Lord Sir Henry Leach, whose wife Lady Leach launched the ship in February 1980. Their daughter, Henrietta Wood, who is the ship's sponsor, along with the youngest sailor on board, 18-year-old Engineering Technician James Deeley, concluded the ceremony in accordance with naval tradition by cutting a special decommissioning cake. The ship, which clocked up 700,000 nautical miles during operations around the world, is part of the Navy's ageing Type 42 class which is being replaced with the hi-tech Type 45 Daring class, the first two of which have already arrived at Portsmouth. Commander Andrew Price, the ship's last commanding officer, said: "HMS Nottingham has served the Royal Navy proud since she was launched in 1980, serving throughout the world. "My time as commanding officer has been one of the highlights of my naval career. Today is tinged with sadness as the ship's career comes to an end but the new class of highly-capable Type 45 destroyers represents a step change in technology relevant for the modern world."